SALT LAKE CITY, Utah – HARMAN’s DigiTech today began shipping its HardWire V-10 Power Block 10-Pedal Isolated Power Supply, a top-quality pedalboard power supply that delivers dependable, noise-free power for effects pedals. The HardWire V-10 Power Block features 10 totally isolated high-current outputs and a shielded low-stray-field toroidal transformer to eliminate hum and noise that can be caused by ground loops and interference. It includes four 9-volt outputs, along with two pairs of 9V/12V merge-able outputs for power-hungry digital pedals, and two outputs with variable voltage. Built road-tough with a heavy-grade aircraft aluminum chassis the HardWire V-10 allows for maximum heat dissipation. With its compact size, the V-10 mounts perfectly under Pedaltrain™ pedalboards. It utilizes standard 2.1 x 5.5mm barrel jack connectors and delivers 1200mA total DC current. The V-10’s front-panel LEDs provide ready indication of output jack status. The V-10 comes with 17 DC power cables, 3.5mm phone plugs and 9V battery clip. “We constantly hear from guitarists that a high quality power supply is essential and we built the V-10 Power Block to provide the same performance and reliability that our pedals are known for,” stated Scott Klimt, marketing manager for DigiTech. 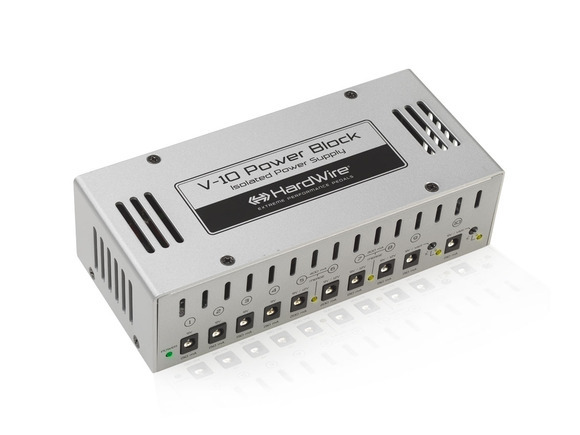 The DigiTech HardWire V-10 Power Block carries a six-year warranty and has a suggested retail price of $299.95.